It all began in 1908 with a splendid idea of a number of Americans and Scandinavian-Americans in New York to further the educational ties between the U.S. and the Scandinavian countries. The organizing meeting of the American-Scandinavian Society was held at the Hotel Astor in November 1908, Nicholas Murray Butler, President of Columbia University was elected as it’s first President. 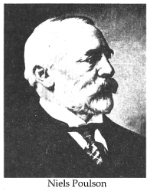 The Society was funded by Niels Poulson , a Danish immigrant and successful Brooklyn industrialist. His vision of cultural/educational ties between the U.S. and Scandinavian countries was made possible by his financial support of our Society in 1910, when he established a trust fund of $100,000. However, New York law required an organization be incorporated to handle large trust funds. Niels Poulson therefore resolved to give stability to the work planned by creating a foundation with a self-perpetuating Board of Trustees. Suggestions were made by others that the projected foundation should be named the Niels Poulson Foundation, but according to the founder’s own wishes it was incorporated under the name of The American Scandinavian Foundation. The act of the incorporation was signed by Governor John A. Dix on March 16, 1911. The Society continued its cultural/education work and in 1919 became the Foundation’s first chapter; the New York Chapter of the American Scandinavian Foundation. In 1982 the Trustees of the American Scandinavian Foundation decided legally to dissolve its ties to all its chapters nationwide. As a result the New York Chapter after 63 years became an independent organization and incorporated as a non-profit, tax exempt, member supported society. We resumed our original name American Scandinavian Society and have successfully continued our mission of presenting cultural programs of art, literature, drama, dance, music and lectures. Read about some of our programs through the years. The significant difference between our Society and other pan Scandinavian organizations rests with the fact that the American Scandinavian Society of New York exists solely for and through its members and for the cultural and educational events it provides. The Society does not involve itself in educational grants or student exchange. It is important to note that our Society continues to grow in membership and influence within the pan Scandinavian community in the tri-state area. It clearly demonstrates to our membership, the diplomatic community and the governments of each of the five countries, the special place and significance of the Society’s work. This is all accomplished by volunteers, the Society has no paid personnel. We continue to operate as we have since our founding with only volunteers who make up our elected Board of Officers, Directors, Program Committee and Art Committee. The programs offered to our members throughout the years would fill a large book and continues to be the raison d’etre for our society. These events are a true reflection of the Program and Art Committee’s effort to seek out, organize and coordinate an entertaining and informative evening. The speaker, musicians, artists, invitations, food, location and budget are but a few of the considerations of an event. These volunteers, many of whom have served the Society for one, two and three decades are the glue which holds our group together. Their constant devotion and tireless effort on behalf of our membership is responsible for our continued success in offering programs of interest to our American Scandinavian audience. Our membership represents all walks of life and the majority reside in the greater metropolitan area of New York, New Jersey and Connecticut, however, we boast of members in 13 states and the District of Columbia, who often attend our meetings and especially our annual Christmas Ball. Our membership includes Sponsors, Corporations, Life members, Honorary members and Regular members. Our total membership has been growing steadily and is approaching 500. Our Christmas Dinner-Dance has been a special highlight of our season since the earliest beginnings of our Society. The center fold of this commemorative issue is a photo of the first formal evening held in February, 1909. This evening affords our members an opportunity to gather at the start of the Holiday season and to many is the real beginning of the Christmas holiday. Our Lucia procession is an honored part of this Gala evening, and the participation of the children and grandchildren of our members a long tradition. This occasion has been celebrated in a number of landmark locations in the city such as the Waldorf Astoria, the Pierre Hotel, and currently the Metropolitan Club. The Grand Ballroom is festively decorated with a holiday theme. A warm greeting awaits those in attendance, with cocktails, dinner and dancing the order of the day. The Society’s Art Committee was organized in the days of the New York Chapter by Elfi Alvin and has been an outstanding success from the beginning! Exhibits of all types of media from the five Scandinavian countries have been offered to our members and friends of the Society. The Committee has invited artists to exhibit their works in various galleries, with the Society underwriting all or part of the expense. Tours of artists studios and discussions with the artists have been arranged for our members. Click to see a sample of exhibits. An example of the excitement and vitality of the work of the Society. We are young and healthy in our 114th year! We are proud to have as our honorary members the five Consuls General of Denmark, Finland, Iceland, Norway and Sweden. They have supported the work of the Society, have participated in and co-sponsored many functions throughout the years. We are forever grateful for their cooperation and continuing support. We have called the Norwegian Seamen’s church home since 1985 and are indeed fortunate to have such a beautiful and fitting location for our office and many of our events. The warm and welcoming environment contributes greatly to our ability to present outstanding programs in the church. Upon resuming our original name and incorporating as an independent, nonprofit, membership organization, our first President Charles F. Brush, PhD., guided our reorganization and through his generosity of time, talent and resource, made his office and staff available to the Society. He arranged for the creation of our logo through his association with a fine graphic designer Bob Pearlman who generously donated it to the Society. These early years were filled with excitement, tension, uncertainty and a great desire to succeed by our volunteers and committee members. President Michael Halpern and his wife Neel, were heavily involved in the formative years of the Society’s reorganization, offering office and staff in support of our work. Our succeeding Presidents have all contributed generously of their time, talent and resource in guiding the society to the successful organization it is today! A source of satisfaction and accomplishment for the Society is the annual awarding of cultural grants to men and women of outstanding ability in art, music, dance, literature and drama. The grants are coordinated by the Chairperson of the Cultural Grants Committee and made through a selection process involving the six vice presidents, representing each country, selecting the recipients. The awards are presented in the Spring following the Society’s annual meeting, and are funded by advertisements in the Gala Journal. Our Board of Directors decides each year the size and number of grants to be made. During the past 13 years, the American Scandinavian Society has awarded over $100,000 in cultural grants to more than 80 individuals and organizations. Through the years much has been written about the Society’s Christmas Ball, as the “real beginning of the Holiday Season”, the “best of the Holiday dinner-dances”, “the most beautiful, the warmest, most friendly Ball!”, “a great and wonderful evening”. All true! Our Christmas Dinner-Dance is the highlight of our season and one of intense preparation and planning. The Program Committee decides and arranges the many details of the evening: the orchestra, the venue, the menu, the wine selection, flowers, favors, the Lucia and the participating children, the guest list and the invitation. All done by volunteers, willingly, gladly and enthusiastically. This truly outstanding evening has been a tradition for decades! A word about our finances. As a volunteer, non-profit, membership organization in New York City, it is increasingly expensive to operate our Society. The cost of doing business, including office rent, equipment, supplies, mailings, newsletters and presenting our programs keep increasing. We are dependent on member dues and the generosity of our “Sponsor” memberships ($100+) and Corporate support to meet our operating expenses. The Christmas Gala Journal, our annual fund raising effort, generates revenues for our cultural grants and other membership activities. The ads purchased by companies and individuals provides the bulk of our funds. It is our hope the Society will be the beneficiary of increased support by the Scandinavian-American business community in the corning years, in order that we may continue our important work of bringing cultural, educational, artistic and musical programs to the Nordic community. We are most grateful to our members, sponsors and corporate advertisers for their continuing support and extend to each a sincere thank you. We look forward to the coming years which will be filled with exciting events sponsored by our Society, events which continue to provide a showcase for the very best in Scandinavian creativity and culture. The vitality and vigor of the American Scandinavian Society can best be seen through the multiplicity of our activities. Check out some past issues from the 1990’s of our newsletter! Exhibits of all types of media from the five Scandinavian countries have been offered to our members and friends of the Society. View the programs archive. Exhibits of all types of media from the five Scandinavian countries have been offered to our members and friends of the Society. View a sampling of exhibits from the past. View online or download a pdf of our 90th anniversary booklet.